I'm not sure if, by definition, a helicopter can be classed as a 'vehicle' - but since there were a few hot air balloons in the DT's fabulous creations this week, I thought I could get away with it! 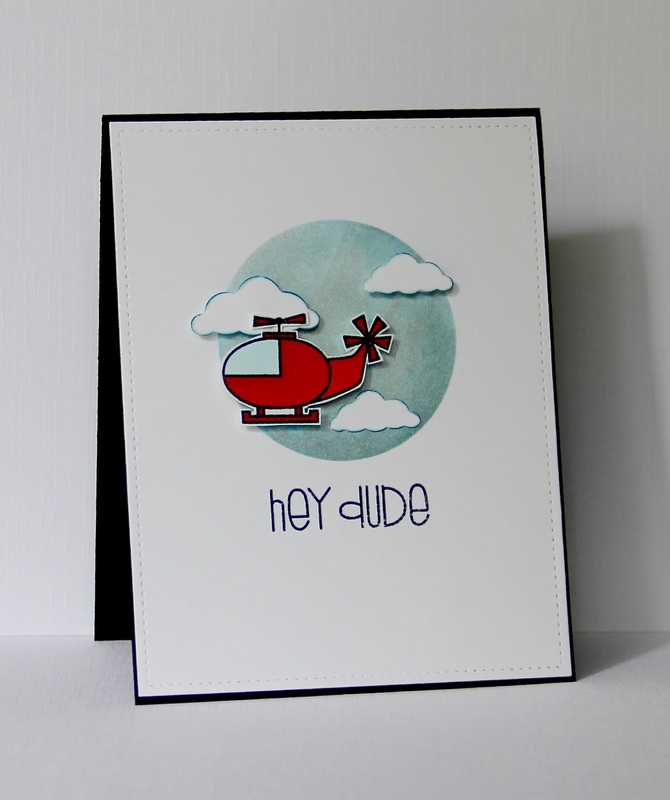 I sponged another of those lovely, shiny backgrounds again as I did here and added some Memory Box clouds and a Paper Smooches helicopter from their Little Fella set. I've coloured the copter in with Copics but it's a lousy day in Sydney today so the shading looks non-existent in the photo. My colouring skills are improving...if only it showed in my photos! Paper Smooches is also having a call out to be guest designer for December so I'll join in over there too. Claire, I'd definitely say that a helicopter is a vehicle...and this one is absolutely wonderful! 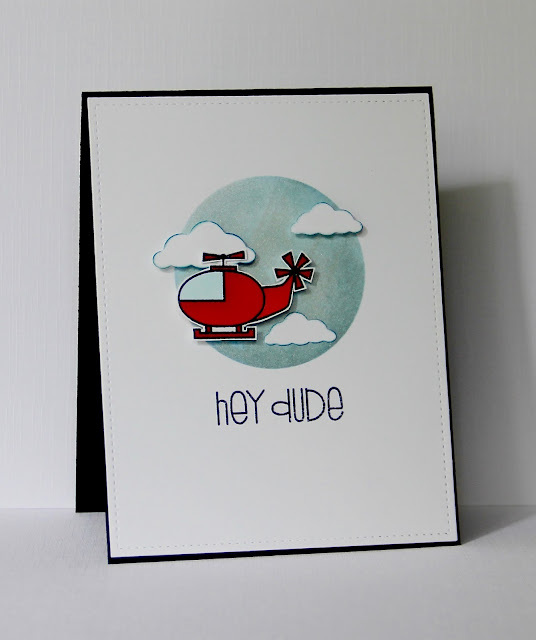 I love the circle masked sky and the popped up clouds...such a fun card! Thanks for joining us at CASology! Awesome card! Love this scene! Oh yes... it's a vehicle in my book! Cute and beautifully executed scene! You make CAS look so easy! Thanks for joining Casology Claire! Cutest helicopter ever!! Love the shiny sky and sweet little clouds. Good luck with the Paper Smooches GDT call - you'd rock it! Thanks for playing along with CASology this week! LOVE it Claire, you are so FAB at your designs!!! AWESOME take on the challenge!!! So glad you joined us this week, I HOPE that you will join us this week too!!!! Oh I love this, so cute! !